The EU and China have signed a deal to end the strife over textile quotas that has left more than 75 million Chinese garments piled up in European ports. Under the deal, half the blocked goods will be released unconditionally. The rest will count against 2006 quotas. The EU imposed quotas in June to stem a huge surge in Chinese imports, after a worldwide, decades-old textile tariff and quota system ended in January. The agreement has still to be approved by EU member states. It was signed by EU Trade Commissioner Peter Mandelson and Chinese Commerce Minister Bo Xilai, following marathon negotiations that began on Sunday and continued through the night into Monday. 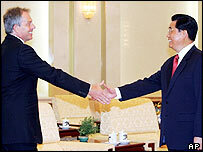 The talks preceded a summit which began on Monday led by UK Prime Minister Tony Blair and Chinese President Hu Jintao. Speaking in Beijing, Mr Blair said he was confident European governments would back the agreement. China's Premier, Wen Jiabao, described the deal as "fair and acceptable to both sides." 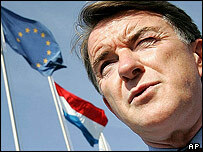 Mr Blair said the strategic partnership between the EU and China was "vital". "The difficulty is that we are trying to balance a number of interests here because obviously people want less expensive goods," he told the BBC. "But then you have textile producers across Europe who are worried about their jobs and unfair competition." European producers fear their business will be wiped out, but retailers say they risk empty racks. The US is also embroiled in a textile war of words with China, for similar reasons. Unsuccessful negotiations in August have led to calls for Washington to introduce its own quotas, allowed under the terms of China's accession in 2001 to the World Trade Organization. Under the old 30-year-old Multi-Fibre Agreement, nations were set annual clothing export limits. The demise of that arrangement led to a massive increase in Chinese clothing exports to the EU, which reacted by imposing import quotas. But as soon as the quotas were announced, retailers and wholesalers rushed to order supplies from China - using up the limits almost as soon as they were introduced. France, Italy, Portugal and Spain, all of whom have large domestic textile industries, have been most opposed to any change in the quotas. In contrast, several northern European states, including Germany and Sweden, are backing their retailers' calls for the garments to be let through.